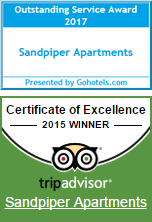 Stay at Sandpiper Holiday Apartments and take advantage of our current specials. Book now or contact us for our guaranteed best rate for your next Broadbeach holiday. Make a Direct 7 night booking or longer in a 1 or 2 bedroom apartment and SAVE! Minimum 7 night stay and must be made 30 days in advance and paid in full at time of booking. No cancellations or refunds. Not available during School Holidays, Easter or Christmas. Subject to allocation and availability. New Bookings only.